Puss in Boots is a Female Cat! What do you know? Another Clever Girl! second son, and his cat to the youngest, who had always been his favorite. So the poor lad was filled with sorrow. “Wherever shall I get my bread?” All at once Puss, the cat, jumped up on the table, and touched him with her paw. The miller’s son had very little money, but he said to himself, ” ‘Tis such a wonderful thing to hear a cat talk! How can I refuse her?” So he took Puss to the shoemaker’s, and got him to make her a very smart pair of boots. When this was done, he found a nice large bag for the cat. herself behind it. Little greedy rabbits, who knew no better, ran into it, to have a feast. Directly Puss pulled the string of the bag, and carried them off to her master. “Roast rabbits? How delicious!” he exclaimed. The miller’s son cooked one for dinner. Meanwhile Puss took away the other, which was a very fine one, and saved it for another day’s meal. 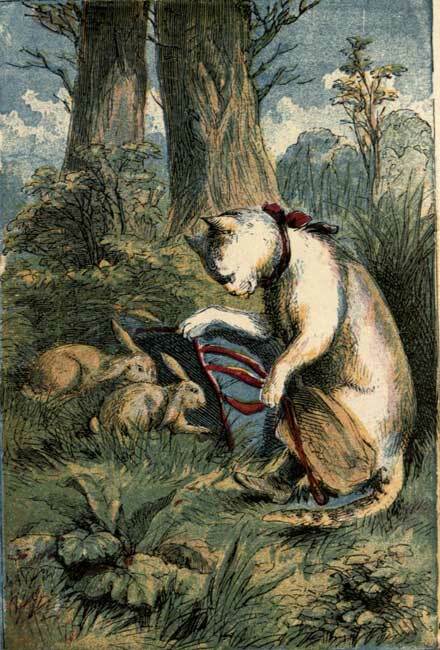 Even though their cupboard was full, early the next day Puss took her bag and went again into the warren, and in the same manner caught two more fine young rabbits. But instead of carrying them home she walked to the king’s palace and knocked at the door. 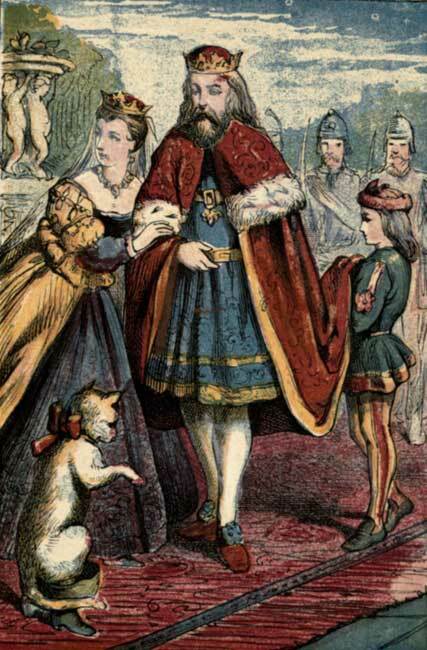 “I am much obliged to the marquis,” said the king, and he ordered his head cook to dress the rabbit for dinner. By the king’s side sat his daughter, a very beautiful lady. She turned to her attendance, and ordered, “Please, give Puss a good cup of cream to show our thanks.” Well, Pull liked very much! She went home, and told her master all she had done. The miller’s son laughed! And every morning Puss caught a rabbit, and carried it to the palace with the same message. “Yes, so I can,” said the ogre. “Oh, yes,” said the vain ogre; and he changed himself into a little mouse. Directly Puss did what cats do. She pounced on that mouse and ate him on the spot! Quickly Puss ran home and begged her master, “Quickly go and bathe in the river! I have something very special to do for you!” By this time, the miller’s son had learned to trust his fine cat, so he obeyed. While he was in the water, Puss took away all his clothes, and hid them under a large stone. Immediately the king ordered his footmen to assist the Marquis of Carrabas. Then he ordered another attendant to ride back to the palace and fetch a suit of his own royal clothes for the marquis. “The Marquis has sent so many generous gifts. It is the least that we can do,” said he. When they were brought, Puss took them to her master, and helped him to dress in them. Now the miller’s son looked quite like a gentleman in the king’s clothes. “Thank you for such kindness, Your Majesty.” said the lad. 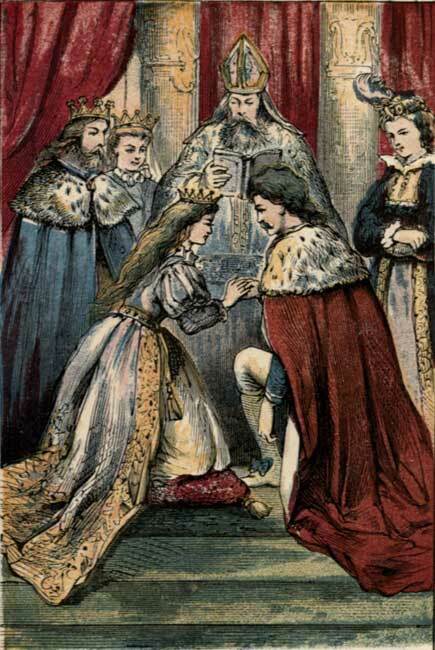 In a wink the king bade him to climb into the royal coach where he sat next to the fair princess. “We will gladly drive you home,” the king declared. Of course, Puss told the coachman which way to go. Then she ran on ahead, and came to a field where some reapers were cutting wheat. “Reapers,” said she, “if the king asks you whose field this is, say it belongs to the Marquis of Carrabas. If you don’t, I shall scratch and bite you!” And Puss showed her sharp claws and fangs! In these parts many folks were afraid of cats and their special powers. “Please don’t hurt us. Our master is bad enough!” the reapers cried. “We promise to do as you say.” Then puss ran on, and told all the other workers on the road to say the same. The reapers answered, “To the Marquis of Carrabas.” The herdsmen said the same of the cattle, and the farmers said the same of the orchard. The king turned to the miller’s poor youngest son, said, “My lord, you have a fine property!” In truth all of the land and the cattle and the orchard had really belonged to that dreadful ogre. And we know what his fate was! So, where do you think that cunning Puss was directing the coachmen to go? To the ogre’s abandoned castle! The king was delighted, for it was indeed a very nice castle, full of riches. They all sat down to a great feast, which Puss ordered to be served. And right there, the king was so pleased with the miller’s son that he thought him a very good match for the princess. So, he invited the lad to court, and in a little while gave him his daughter for his wife, and made him a prince. 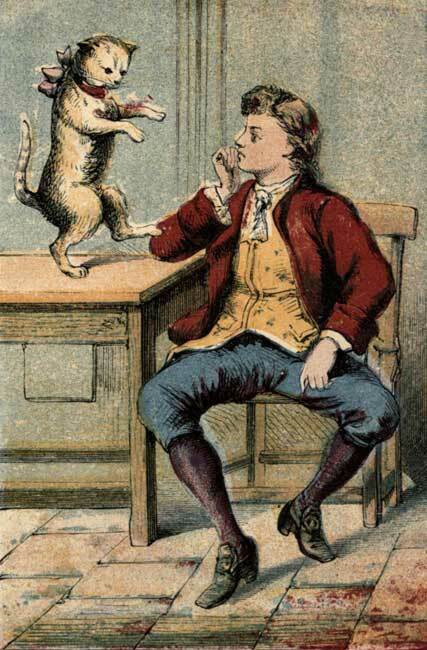 From that day on, you may be quite sure that the miller’s son was grateful to Puss for his good fortune, and that clever cat never had to catch mice for her dinner any more, for dainty meat and the best cream were every day given to Puss in Boots. Oh, Looky Here….Mirror, Mirror in my Hand, who is the most clever kitty in the land? Puss In Boots!